In June New Zealand’s governing National Party has jumped 3.5% to 46.5% after Finance Minister Steven Joyce handed down a New Zealand Budget projecting a string of surpluses over the next few years. 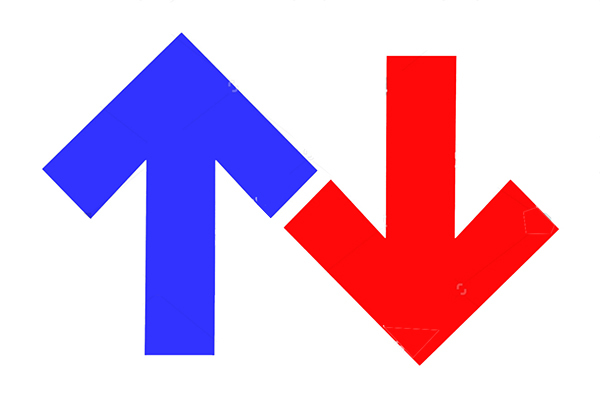 National are now well ahead of the opposition Labour/Greens alliance which dropped 3% to 39.5%. Support for a potential Labour/Greens alliance was down 3% to 39.5% caused entirely by the 3% drop in support for Labour, now on 25.5%, while support for the Greens was unchanged at 14%. Support for New Zealand First was down 1% to 9%. 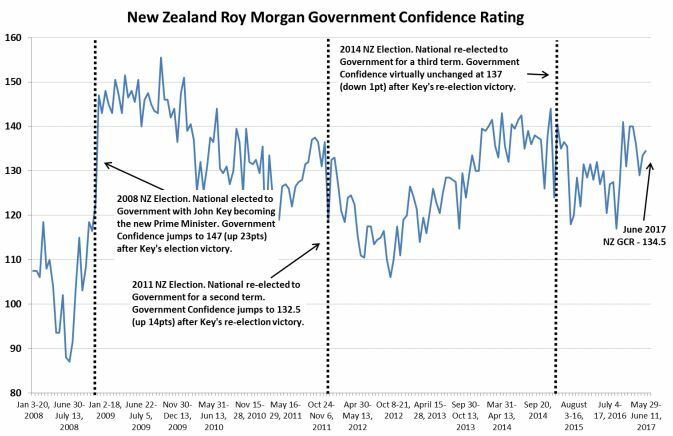 The Roy Morgan Government Confidence Rating has increased 1pt to 134.5pts in May with 61.5% of NZ electors (up 1%) saying NZ is ‘heading in the right direction’ cf. 27% of NZ electors (unchanged) that say New Zealand is ‘heading in the wrong direction’. National has increased its support 3.5% to 46.5% following a successful NZ Budget which projects a surplus of $1.62 billion this year increasing to a considerable $7.2 billion in 2020. New Zealand’s projected Budget surpluses are in stark contrast to the continuing Federal Budget deficits across the Tasman in Australia which hasn’t seen a Budget surplus since 2008. The increase in support for National came primarily at the expense of the main opposition Labour Party which dropped 3% to 26.5% - its lowest level of support this year while likely Labour partners the Greens were unchanged on 14%. The strong performance of the New Zealand economy is backed up by a rising Roy Morgan Government Confidence Rating – now at 134.5pts and a strong ANZ-Roy Morgan New Zealand Consumer Confidence Rating of 127.8 – more than 10% higher than the equivalent Australian measure (now at just 112.4). Electors were asked: “If a New Zealand Election were held today which party would receive your party vote?” This latest New Zealand Roy Morgan Poll on voting intention was conducted by telephone – both landline and mobile telephone – with a NZ wide cross-section of 874 electors during May 29 – June 11, 2017. Of all electors surveyed 6.5% (up 1%) didn’t name a party. It's going to make for an interesting election night. Past history shows the polls right before the election are reasonably on target, although they're often wrong about smaller parties. If we get another National Government I think I'll just start trading to the detriment NZ because it's a clear signal that Kiwis want to be worse off by giving their money to people at the top. Labour should be embarrassed themselves, poor ideas, lack of knowledge and serious lack of leadership. Seems like Labour has more idea on housing, but too many investor-voters will cling to National out of selfish interest. I do think this election will feature a stunning lack of charisma from the leaders of the two largest parties. Will be interesting to see if Bill English having his readiness to lie to the public exposed will have any effect or whether voters' selfish interest will overwhelm any morals they might lay claim to. One thing's for sure - if/when National gets back in we can look forward to increasing inequality, more subsidies to property investors and businesses, and young native Aucklanders kissing their chances of home ownership good bye. It'll be another three years of doing nothing on the housing front. "Labour will remove the Auckland urban growth boundary and free up density controls. This will give Auckland more options to grow, as well as stopping landbankers profiteering and holding up development." I think this will go a very long way to solving the housing crisis and the election or defeat of National will be completely irrelevant to its implementation. if you lived in Auckland, within 50 km of the CBD, you would quickly realise what a daft idea that is. The Southern Motorway is the only direct route into the CBD before Manukau for the rest of New Zealand, whether for commercial freight or everyone else. The Western Ring Road will just bring more traffic onto it heading South etc. The biggest priority for Auckland is to have the Motorway infrastructure sorted and not rely on poor Public Transport as an option. Hey lets not kid ourselves here, everyone votes out of selfish interest whether it to be to hang onto what they have or the have nots trying to get more of what they cannot currently afford. When the Prime Minister appears to have been lying to the Police and involved in a cover up over illegal recordings you have to question the ability of the opposition parties. They can't capitalise on easy pickings. I was thinking the very same thing this morning as I was listening to the Labour Party chairman being interviewed on RNZ defending the accommodation for its volunteers. How could something so relatively minor distract from the illegal activities, and lies to cover it up, within the National Party? The thing is that story was a non-event as the article I read the problem had already been addressed. However the fact that it happened in the first place shows that Labour is no different to National. I look down on National for being crooks but I also look down on Labour for having unpaid interns. If people are doing useful work then you pay them, if MPs commit crimes you boot them out of the Party. Personally I think unions are amongst the worst employers / clients you can ever work for, been there done that never again. If MPs are committing crimes they should be going to jail IMHO. I would like to think that if MPs commit crimes that can be punishable by up to 2 years in gaol the police will treat them the same way as any other crim. Am I just being foolish, this is NZ after all. Where is our Fearless James Comey? Labour is no different to National because National used taxpayer funds to cover up a crime and then lied to all and sundry about it, while Labour has volunteers helping them? What on earth sort of logic is that? I have worked with National party volunteers - of which there are plenty. There is a massive amount of volunteerism going on in every political party. You must be aware of that? Are you saying National is guilty of unethical labour practices for only providing tea and biscuits for their volunteers, for example? Clearly Labour thought there was something wrong as they had to make changes to the arrangement before the media caught wind of it. How many other Labour camps with students on working visas, working unpaid except for room and board are there around the country? Does National do the same thing? You shouldn't have drawn my attention to this because it looks even more dubious than what I originally thought. Yes, everyone quick look over there.... Stop thinking about the prime minister getting caught lying, and questions around hush funds buying victims silence and political influence of police investigations. I look down on National for being crooks but I also look down on Labour for having unpaid interns. Do I really need to quote my earlier comment? You should perhaps consider than you are drawing attention away from National's criminal conspiracy by focusing on Labour's immigrant concentration camps. Maybe you need to have a think about whether the two news items are really in the same league. And then have a think about whether using the term concentration camp is suitable. I heard one of the interns on an RNZ interview tonight and she seemed pretty happy with the experience. And if still a smoker - he'll be paying more tax than the lot of them!!!!!! Uh no. What is clear for me anyway is people are voting with their wallets. So Labour has some fairly sound ideas on how to address say housing but more than enough voters have one or more investment properties houses and dont want the market to crash (and probably not even stagnate) that's greed IMHO. Then there are the others probably a decent % like myself that look at the costs the Greens are racking up to buy votes and think that's a serious hit on my wallet because with housing specualtion off limits there is no one left to tax but the oens already paying the rump of tax, the PAYE'rs. For me what's playing out here is GREED pure and simple, followed by FEAR or a mix thereof. The rich / well off must be laughing their heads off. If you want houses taxed - that's Gareth Morgan! Had he not gone for the family home - he might have had better chances - but he's one of those tax purist types (i.e., like the must-have GST on everything purist) or he needs the dosh from those pensioners that own their own homes in order to balance his books to be 'tax neutral' policy wise. Indeed - and not surprising that National's in front. There's not much that Labour has to offer in the way of talent. Big question mark about Labour's leadership. What's new?! National has a particularly strong team going into this year's election. National's leading lights seem to be mostly people that are either incompetent, corrupt, hypocrites, out of touch, have worrying levels of conflicting interests or have been rewarded for being inept. (or a combination of any of those). If they are examples of a "strong team" then NZ politics is in a worse state than I feared. As much as I disliked Key at least he knew how to play the game, most of the rest of National are a complete joke, but what's worse is how Labour don't seem to be able to capitalise on that and the media, and joe public just lets it slide. Not quite sure we can use the word talent (if that means intellectual grunt) in the same sentence as National either - but I'd be willing to bet that if we IQ tested the whole house and then averaged it across all parties - it would be one of the minors who won the race. and neighbors to educate them about how the inequality, homelessness and the inadequate public services affected the quality of life in NZ (especially in Auckland) and the importance to vote for change this time. Even the recent arrivals are sick and tired of unlimited immigration and would like to vote for less or no immigration. Just talk to the right people and the election result, which actually matters, will be different. See I was shot down yesterday when I said that the Todd Barclay affair was a sideshow that would not influence voters . It's worth noting the survey was conducted between May 29 – June 11. I agree that the Todd Barclay affair probably won't affect voters but we'll have to wait until the next poll to see. Eh, I was the one debating with you, but I would agree with you that for many died in the wool National voters they'll absolutely excuse Bill English lying to the public and National's use of taxpayer money to cover up a crime because hey, "it's our team" and eh, ends justify the means. And then cover their ears and write it all off as a vast left wing conspiracy, and potentially victimisation of a poor naive young millenial who would never hurt a fly. I objected to what appeared to be minimisation of the seriousness of it, not to any argument that National voters will excuse it. Totally agree. Absolutely abhorrent to see the likes of Bennett and Collins calling this "a tragic" thing to happen to Barclay, and saying "these things happen" etc. He broke the f'in law! And if he didn't then why his refusal to speak to the police? As they tell us on 5-Eyes etc, if he's got nothing to hide then he's got nothing to fear. National should be renamed to the Irony Party. It's not just Five Eyes or their MPs committing crimes and then using John Key's budget to bribe someone to not talk. They passed Section 92B of the Copyright Act and then turned around and stole Eminem's music for their polictical ad. Their defence that the song was generic and uninspired (just what National needed for their advertising). Or getting HNZ to sell off houses so people get emergency housing for a much greater cost than holding an asset on the books. They really do have a record of expensive failures. Failing to put two and two together on co-ordinating immigration and housing policy, failing to adjust to housing shortages by either increasing supply or reducing demand, then having to provide emergency accommodation in motels at $550 million for just a couple of months is inexcusable. Do we have a collective case of Stockholm Syndrome? I despair. You consider the readers of interest.co.nz a random sample? I consider many here have random minds. I was just pointing out how arbitrary your comparison was, given that you are dealing with two very distinct sample distributions. I do not have a landline, I have never been polled, by anyone, and I strongly suspect that polls are not a fair reflection of general sentiment. I see this poll was taken prior to the Barclay debacle when did Little present his immigration policy. I suspect there are a few things to filter through. I gather that 75% of figures are gathered via landlines, I no longer think 75% of people have them anymore. Labour announced their immigration policy on June 12th, so that's not in this survey either. Does it usually take two weeks to release a poll? Given what has happened in the last 2 weeks -Labour's immigration announcement and the Barclay affair -this poll has the possibility to colour the interpretation of those events in an unfair manner. Times have change but may be not the people who are conducting the survey. With Social media and internet things have changed. Do they call just landline or mobile also as now days many home do not have landline but just mobile unlike few years back. I would imagine that younger people tend not to have a landline, so polls likely sounding out the older demographics, the younger vote is not being heard, until polling day. They say they ring mobile phones as well Peri. Given my mature age (not Superannuate) I can assure you I have never had a call in my life. I find their Polls inaccurate at the best of times and this one more nonsensical than any others. Breathe - we are all in this together so just pick who you want to vote for and make sure you give them your Party vote. 20% of NZ-ers don't have landlines anymore. In detail 50% of millennials have no landline and only 10% of boomers have no landline. So landline polls have serious data interpretation issues. Of course, the younger generations are also less likely to vote too. "This latest New Zealand Roy Morgan Poll on voting intention was conducted by telephone – both landline and mobile telephone"
These polls are dribble just like Winston said. Enraged millennials will be out in full force this year. and before you all say look at the UK - dont forget that despite being hailed as a great Labour success - they are still 60 seats short of the Tories and 70 from having a majority! Actually kpnuts - the last Election was as dirty as I have seen in any Election. National may have had a majority but not enough seats to charge ahead alone. You may want to consider who they picked to give them confidence and supply and question whether you want to see a repeat of that. You only have to go back to the first 6 years of the Clark Govt to see more teflon. .the teflon is only on MSM. Delve deeper and we had huge disatisfaction. This will be a brexit syle surprise to MSM. The Nats are toast...i have no doubt. I agree - Either NZers are asleep at the wheel or they're drawing the poll from John Key's rolodex again. The incumbents could just as well go out at night stealing and eating babies and it wouldn't reflect in the polls. Well all that means is that the incumbents are good at their job. Staying in power is always the first priority. You lose that, then you are on the back foot. That's why they're such a disaster. Paid to legislate and manage and govern for the benefit of the nation, but they can't be arsed doing any of that, because they're too busy campaigning and stuffing their pockets. Bunch of lazy frauds. Unfortunately & sadly, predictable. Looking at the other side of the coin it means a continuation of the insipid and useless parliamentary opposition we have witnessed for far too long now. This failure to uphold effectively, the Westminster System of our parliament has let all of us down badly, and allowed this government a free rein, which they have exploited to their arrogant & uncaring best. Ms Wagner & Mr Barclay being the latest prime examples.Ironically, the last useless opposition we had was led by one Mr English, oh well, what the hell! Bugger. Clearly a government doesn't have to do much to stay popular. What concerns me is only 6.5% were undecided. Agree traditional poling methods make a number of assumptions. I think the under 30s will have a bigger turnout because their options are for the first time much lower than they have been in past elections. This is unlikely to show up in traditional polling techniques. Lets face it, running away to Aussie or the UK is just not the option it was in past election years. The impression of a political party is important as an average person simply does not know the nut and bolt of their polices let alone any their intricacies. Labour gives me an impression of representing ppl on benefit. National give me an impression of representing ppl with properties or really close to have a property. First give me an impression of representing pensioners. Maori gives an impression of representing no one. as the belief was so strong that Labour was actually Communism in disguise. Indeed NZ had a very active Communist party for many decades with ouvert Marxist/Stalinist ideas. They never won a seat in Parliament buut were very influential in such movements as the "Halt All Racist Tours". The Labour party did well for the people under Seddon, Nash and others but lost its way in recent years as the battle for the workers rights became old hat. Labour needs to re invent itself, get rid of the Greenies, give itself a new name and modern ideas otherwise it will disappear as a viable opposition. It's pure demographics. At the moment you have older, landed folks voting in their self interest. This is for a conservative government that puts the tax load on workers while subsidising property owners and businesses. If and when a young and unlanded demographic starts to vote again then you'll likely see a swing - just as Labour first swung into power to implement land reform and put land out of the hands of the few and into average Kiwi hands in the past. Once young Kiwis realise National is shafting them they'll be best placed to look to someone such as Labour or the TOP, those who are actually looking to rebalance things away from regressive taxation. Looks like I was wrong. The Communist Party is alive and well and living with RickStrauss. I'm simply pointing out that you're probably calling time too early and there will likely be a demographic swing in the future. This much should be obvious and easily grasped. E.g. if more of the population is renting then a party offering tenancy law improvements will get traction. You clearly have some new definition of Communist quite different to my understanding, care to share it? this despite becoming a super city that Len said would save money and limit rate rises - did neither - and has grown from around 8000 to 11500 staff since amalgamating. rate rises massively exceeded inflation year after year and the promised cap taht Len and now Phil Goff ignored - Auckland Region is close to 1/3 of the population and should easily be able to make some of these investments given the huge rates income it has - but it chooses not to and instead fritters it away or wastes it on an increased bureaucracy that is more and more inefficient with every year that passes. Young people should be voting for Winston Peters who has great policies for the young. Just look his policies up on line and sign up for his emails. "landed folks voting in their self interest." Everyone votes in their own self interest. That is how democracy works. That line of argument became redundant after Muldoon's reign. Its nothing to do with left wing vs right wing anymore. Its Neoliberalism vs non-neoliberalism, and the divide transcends political lines. You only have to think about what happened during the Rogernomics years to realise that. Today in 2017 the Labour, Green and NZ first parties are the only non-neoliberal parties with all the others IMHO falling into line with National staunchly neoliberal agenda. The people who've been screwed by neoliberalism are not blue collar communists working at the freezing works, they're young engineers, doctors, lawyers and scientists who've come out of university with tens, sometimes hundreds of thousands of dollars of debt and they realise their future are very bleak indeed when compared to their parents. Young people today listen to the lies and denials from government and watch all the real estate around them being seized by foreigners, many of whom ironically originate come from a communist country. Yes indeed BigDaddy, please save us from the communists and neoliberals, but not in the way you would imagine. The great expansion upwards into the middle class, for want of a better description, has snuffed out the traditional electorates that Labour rose to power on and it would seem, still think they can rely on, very misguidedly. The old cloth cap voter block is no more. For example, how many meat worker union voters nowadays compared to the days of Kirk, or even Lange? The beauty of the internet... every fool has his say. all three want what lady 1 is on and talk amongst themselves and it has made them negative towards management as to different treatment. but put them in a meeting with management and ask them to discuss they stay silent. why? This election, have doubts if national will be able to form government and even if it does will not be without Winston Peter. Definitely. My kids will be voting for the first time as they are pissed to put it bluntly. They have never been interested before. Their comments to their grandparents (who with their housing investments greedily stick to the status quo) mean that they don't get to see each other as much as they used to. The kids have also identified Winston as their go to guy even though to my eyes he seems to be keeping his powder largely dry atm. Probably makes sense when you have farmer doing all the running for him. I voted National last election (and the 2 before) but not this time as I am convinced we are not heading in the right direction - housing, immigration, environment are examples. I meet with a lot of people around NZ in my work and feel that there are a lot of people who feel the same. I find it hard to believe that 61 percent of NZ'ers believe we are on the right track! Kdm - I'm afraid the problem is that so many left voting bloggers go onto blogs claiming to have voted National all their life, and are now so disgusted at something they're going to vote Labour this coming election - this practice obviously tends to mislead other left wing voters into thinking that there's some big shift going on, which isn't borne out by subsequent polls, leading to frustration and confusion as this series of postings highlights here. They should know who to blame. Kdm you are not alone. So many who have been voting nation will now be voting for change. It will only after the election results are declared that national will realize what happened but will be too late. I wouldn't say so, no. Do you really believe the government has so little control over the running of the country? My life is great but there are plenty of people less fortunate (and yes, luck is a huge component) that this government isn't supporting. I can do my bit to achieve the country I want (clean and green, swim-able rivers, diverse ecosystem) but I need the government to provide the real firepower to achieve things like that. This is an absurdly anti-democratic implication. Are you suggesting, that non-conformance, or dissent in a democratic society is equivalent to a lack of personal responsibility? National will find its stupid meddling like this that loses elections. Helen did something similar with light bulbs and showerheads right before they lost in 2008.